Your feet travel between 240,000 and 320,000 km in your life time. For everyone from children to seniors, teens to Olympians, your foot health is of prime importance. And when it comes to foot care, experience matters. 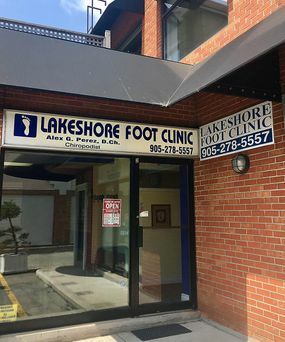 Lakeshore Foot Clinic of Mississauga is dedicated to the treatment and prevention of medical foot problems. Our goal is to improve the quality of your life by eliminating pain, providing ongoing support for chronic conditions, and helping you stay mobile. We treat our patients as we would like to be treated -- with compassion, respect, and professionalism. We are highly experienced, with the most up to date treatment modalities. We have expertise in gait analysis, laser and shockwave therapy, chronic nail and skin conditions, high risk feet, and custom orthotics. We work hard to provide you with the services and products that you need. We are open six days a week and welcome walk-ins and inquiries. Our services are covered by extended health care plans, including DVA and WSIB. Call for an appointment today!